Want your head to explode? Search “Loft vs. Attic”. Seriously, people cannot agree on what exactly constitutes a loft or an attic. Many will argue that they’re synonyms and can be used interchangeably, but if you’re a writer, like I am, you know that there’s always a difference, even if it’s subtle. 1. Size. Attics usually span the whole upper floor while lofts are just a section. 2. Openness. Attics are enclosed, but lofts are open. 3. Windows. Attics have windows…or was it lofts? Both have been claimed. 4. Building Type. Attics are in residential buildings and lofts are in commercial. Many disagree with this. 5. Location. “Loft” is a term more often used outside of the U.S., but means the same as attic. It’s important to note that none of these definitions include loft apartments, which have a whole category unto themselves and are usually located in commercial buildings or large townhouses that have been converted. 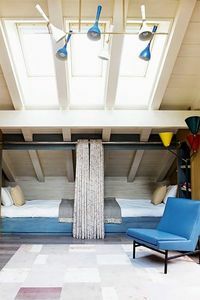 No matter what you call it – a loft or attic – these spaces are usually paired with low walls, angled ceilings, and oddly shaped spaces, which is why they’re so often better suited for storage. However, done right, they could make for interesting additional living space. Here are some of our favorite conversions. On her blog, Kelly shared her full home makeover, but her attic conversion is absolutely beautiful. The paint colors are relaxing, she made full use of the odd spaces for storage, the windows make a normally dark space bright, and she even managed to fit in a full walk-in tile shower. Make sure you check out her home tour for more pictures. You may know Ree Drummond from the popular Food Network Show “The Pioneer Woman”, but she started out blogging. On Country Living, she shares the bedroom makeover completed for her tweens at her Oklahoma ranch. What sets this conversion apart from others are the hanging beds, which really seem to open up the room, which has short walls and low ceilings. Located on Lake Michigan is a beautiful shingle style cottage designed by AMDG Architects. They put in a lot of time designing this home to fit perfectly for the needs of the family commissioning. One of the boys in the family is an avid reader, so AMDG made sure to include this beautiful reading nook. You can see the whole home on AMDG’s website. The Patriotic Peacock visited the Coastal Living Ultimate Beach House in 2012 and shared pictures from her tour, which included this home theater. The home has a high cathedral making it perfect for installing multi-level seating and hanging pendant lighting. A design like this could be tweaked for a lower ceiling. See the whole house tour on The Patriotic Peacock. A retired couple hired Shannon Wollack and Brittany Zwickl of design firm LIFE.STYLE to create an attic bedroom for their grandkids. Wollack and Zwickl used every available inch of the room optimizing it for beds and storage. White paint helped brighten up the room and star wallpaper added a fun touch. See before and after pictures on My Domaine. This tween/teen bedroom designed by Kate Earle takes full advantage of the low ceilings and short walls. 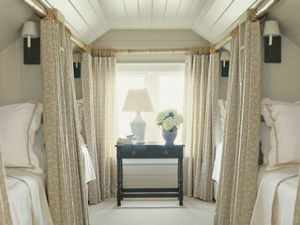 Two twin beds face each other and are divided from the other room by a curtain hung on a rod between the beams. This design could be replicated without a whole lot of construction knowledge. Two properly sized beds and tension rods in the right room could be enough to pull off the same look. Read what Kate had to say about it on House. Another great way to fit sleeping quarters into an attic space is with galley beds. These from Veranda Magazine were designed by Jane Marsden and have a touch of elegance to them. Quality curtains, nice bed linens, neutral colors, and personal lamps make them the perfect choice for visiting family or a vacation rental. See more from Jane at her website. 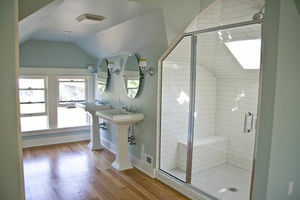 When most people decide to put a bathroom in the attic, they usually opt for a walk-in shower. However, some layouts still allow for a full bath and Tim Barber did that beautifully with this bathroom. 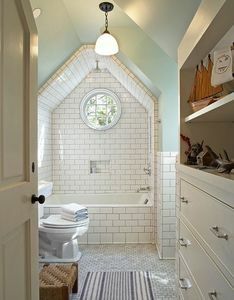 He positioned the shower right in front of the small attic window and used floor-to-ceiling tile, which he wrapped right around the window and across the alcove’s ceiling. 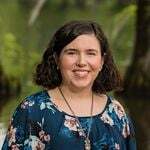 You can see all of the pictures from the home on Tim’s website. 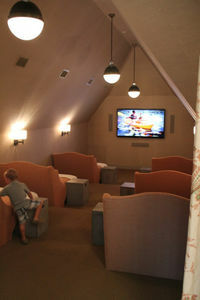 An attic can be a great hangout place for tweens/teens. 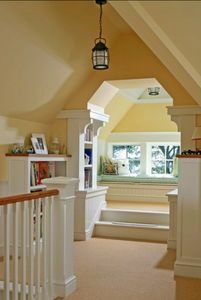 This design from Wright Building Company is the perfect example of how a simple attic space can be converted with simple built-ins, a couch, chairs, and bright colors to make a fun setting for a younger crowd. See more of WBC’s designs on their website. 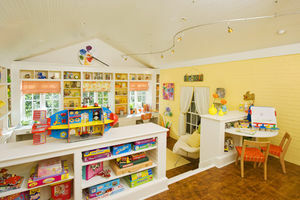 This attic craft and play room by Margaret L. Norcott was showcased at the 2010 Atlanta Symphony Show House & Gardens. Some of the features include wall-to-wall shelves, bright colors, fun prints, magnetic boards, a puppet theater, window seat, and pint-sized seating. Any little one would find this fun! If you have a finished room over the garage, some of these designs could also apply. 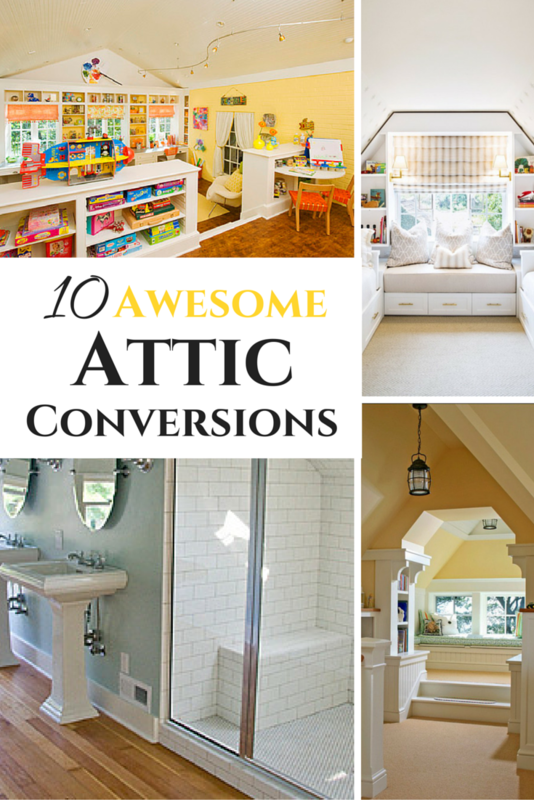 Other features we’ve seen that were not included here are attic swings, full-sized playhouses built around crawlspaces, kid-only attics accessible via climbing walls, and full separate “in-law” living quarters. Please remember, if you plan to do any sort of major renovation, like a bathroom, make sure you file for a permit or it may not be included in your heated square-feet. Have you seen a cool conversion not shown here? Share it in the links below!